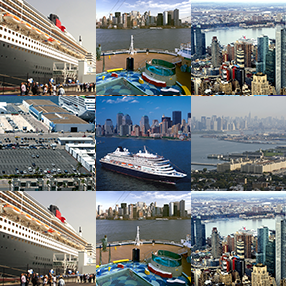 New York is the 5th of top ten cruise ports having hosted 586,000 U.S. embarkations during 2012. It generated $1.24 billion in direct spending through 857,000 cruise visits. The Manhattan Cruise Terminal handled approx. 90% of the passengers while the Brooklyn Cruise Terminal welcomed the other 10%. New York area tourism-related businesses, such as travel agencies, airlines, hotels, etc., received approx. $369 million, or 30% of the cruise industry’s direct expenditures. The cruise industry is a key driver of the U.S. economy, contributing $42.3 billion in gross output in 2012. New York has become primarily a place of embarkation for cruises to Canada, Bermuda, the Bahamas and the Caribbean representing 5.8% of total U.S. embarkations. The mission of the New York Cruise Ship Alliance is to strengthen and expand the role of the New York based cruise ship industry which has strategically contributed to the economic rebirth of New York City. We are advocates of public policies that will allow the industry to sustain its ability to create jobs, invite investment and participate in the ongoing renaissance of the city’s waterfront. Working with New York’s tourism and destination industry, we ensure New York Harbor remains a key port for national and international passengers seeking to enjoy the benefits of visiting the city.